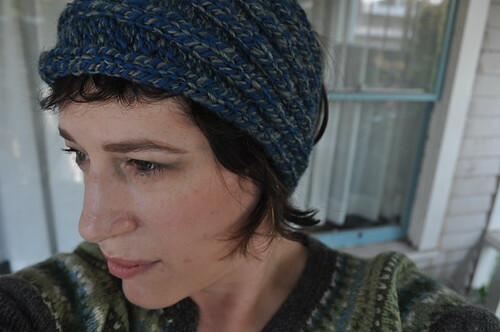 I knit this headband in just a few hours from some handspun merino. I'm skeptical that this style suits me. I think you need more or less hair to pull it off. I'm in that awkward in between length. In the last few days I cast on a bunch a new things. My Swissies in handspun Romney-Coopworth-Angora. I don't think I have enough to knit the crown so I'm pondering what to use for it. 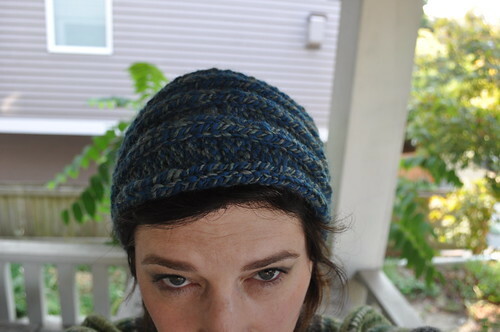 An improvised hat in handspun samples from my first spinning class. I also ran out of yarn on this one and have been rooting through my stash to see what I can put together to finish it. An improvised hat in naturally-dyed Cascade Eco Alpaca. These are more class samples, sadly unlabeled. Cascade in a skein of Cotton-Ease. Old, old, olllllllld Cotton-Ease. I need to get some buttons to finish this one. It's an adorable pattern that is free and only takes 150ish yards of worsted to knit. Great last minute baby gift. With the leftover Cotton-Ease I'm making the Little Knight, Purple Newborn Hat. There's also a Spiral Cowl in some Lorna's Laces Pearl that I forgot to add to the photo. I will hopefully finish all of these by the end of the month. 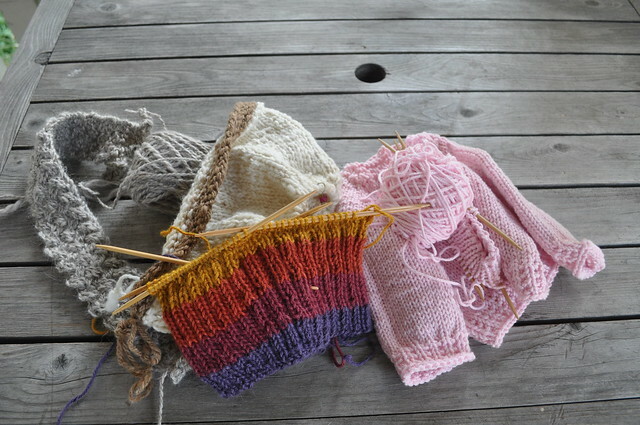 I have really been loving this process of using up all these old odds and ends of yarn. And handspun! I never use my handspun.